Background: The impact of fungal infections on human health has increased considerably within a past few decades. Although drugs with antifungal properties are available, but they are less effective and are associated with side effects. Objective and Method: To screen the bacterial isolates from Sesamum indicum and to investigate the antifungal activity of the screened bacterial isolates against Aspergillus sp. Co-culture assay and agar overlay were used to scrutinize the anti-Aspergillus activity. Furthermore, optimization of media and growth conditions to enhance the production of anti-Aspergillus compound. 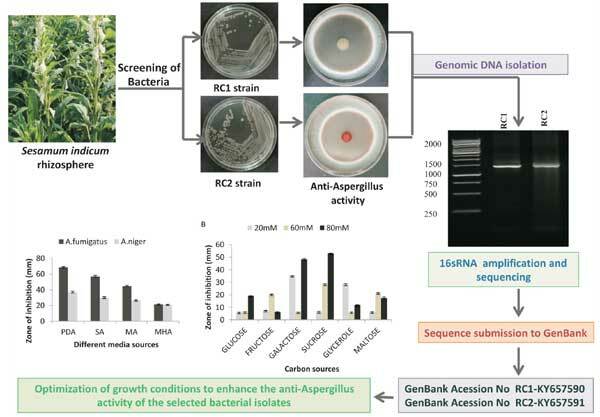 Results: Several bacterial cultures were isolated from Sesamum indicum rhizosphere collected from Mandi (H.P.) India. These bacterial cultures were assayed for antifungal activity against Aspergillus species i.e. A. fumigatus and A. niger. Two most potent strains were chosen for more detailed analyses. The biochemical characterization and 16S ribosomal RNA sequencing revealed that Burkholderia sp. strain RC1 and Acinetobacter pittii strain RC2 exhibit strong similarity (100%) with Burkholderia sp. SR2-07 and Acinetobacter sp. strain 3-59. Additionally, it was also validated that RC1 and RC2 showed significant difference in the production of anti-Aspergillusactivity under altered growth conditions. Conclusion: Results from this study recommend that plant rhizosphere remains a rich hotspot for delivering a novel antifungal compounds. Keywords: Antifungal, Rhizosphere, Pathogens, Bacteria, Infection, Anti-Aspergillus. Keywords:Antifungal, Rhizosphere, Pathogens, Bacteria, Infection, Anti-Aspergillus. Abstract:Background: The impact of fungal infections on human health has increased considerably within a past few decades. Although drugs with antifungal properties are available, but they are less effective and are associated with side effects.